Arnold Schwarzenegger looks to be going through a rough patch right now, with the secret child and an impending divorce. The word is that his planned return to cinema, and most significantly the Terminator franchise, is most definitely delayed at this point. So there is nothing left to do but return to the films from the past. I’m speaking of the first three only, of course, and in this case it is best to start with the original. Helmed by James Cameron, this first film is a shockingly good time. 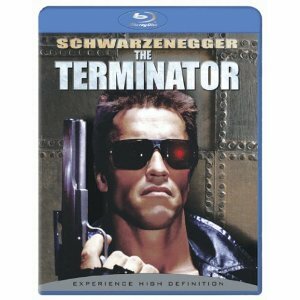 It has groundbreaking special effects (for the time), and Schwarzenegger is the villain in this first film. What’s more, this was the ideal movie role for the Austrian bodybuilder. He barely had to speak, and mostly just looks menacing and indestructible. Schwarzenegger is a cyborg killing machine sent from the future to kill Sarah Connor (Linda Hamilton), a hapless woman who is unwillingly involved in the future war between robots and men. Meant to father the child that will one day become the leader pf the resistance, and humanity’s last hope, Connor is a target thanks to the abilities of time travel. There is no reason any action fan shouldn’t own this film in high definition, and there is no better package than this one. This limited edition Blu-ray book comes with exclusive photos, trivia and even some words from Cameron. The special features on the Blu-ray aren’t quite as spectacular, including only two featurettes and seven deleted scenes, but the entire package as a whole makes it desirable. This is the best yet, and only once they finally finish the franchise and put them in a box set will we likely see anything better than this.